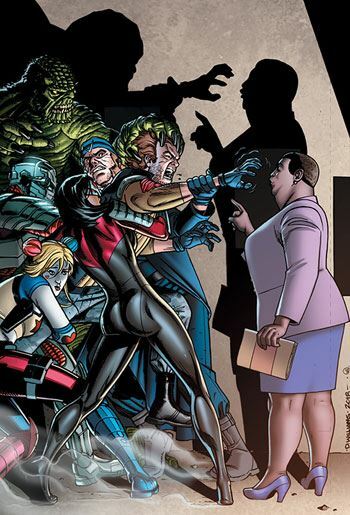 I wasn’t overly keen on the latest issue of Suicide Squad while reading it. It had its moments, but so much seemed a retread. Amanda Waller gets captured, but we’ve seen that before. Rick Flag is back with the team, which makes it really feel as though he never left. What happened to Captain Cold? Was he just there for a one-shot? Yes, Enchantress is (currently) dead, but since she is back in both the stories in Suicide Squad Black Files, her absence feels more like taking an issue off rather than being dead. Harley is being Harley, Captain Boomerang is being Boomerang. It’s all very familiar. And that isn’t always such a good thing. Especially for a title that promises death and shake-ups, just from its logo alone. I was pleased, by the time I reached the end of the issue, that there was a genuinely surprising twist, and a situation set up that is unlike any we have seen before. In truth, that made the rest of the story worthwhile. Because it’s not like the issue was bad in any way. It just took an awfully long time to become distinctive. The book does, however, need to shake up the team. We need some characters to die and stay dead. We need some new blood that will stick around for more than a story arc. I hold Ostrander’s run as the Platonic ideal for Suicide Squad, and the constantly changing dynamics were a big part of what made that work. Issue 50 is coming up. That would be the perfect time to make some big changes. So I remain in hope. But it’s not so tragic, when the stories are fully enjoyable anyway.